The SS Politician was an 8000-tonne cargo ship which left Liverpool on the 3rd February 1941 laden with amongst other things 260,000 bottles of whisky, bound for Kingston in Jamaica and New Orleans. The whisky was for the American market and therefore no duty had been paid. She sailed up past the Isle of Man towards the Hebrides where the winds increased to gale force. On the morning of 5th February a young man was combing a beach in South Uist when he saw the ship in trouble and beginning to list. After a valiant struggle by the Captain, Beaconsfield Worthington, to keep his ship on course, the SS Politician eventually ran aground in the strom onto sandbanks off the Isle of Eriskay where she began to flood. Unfortunately as the ship had veered off course an incorrect location was given to the lifeboat crew on Barra. Local islanders were roused and they set forth in a sailing boat to offer assistance to the crew. The lifeboat finally reached the ship and all the crew were rescued. When the locals learned from the crew exactly what the ship was carrying, a series of illegal salvage operations took place at nigh, before customs and excise officials arrived. The islands supplies of whisky had dried up due to war-time rationing, so the islanders periodically helped themselves to some of the 260,000 bottles of whisky before winter weather broke up the ship. Boats came from as far as Lewis as news of the whisky travelled across the Outer Hebrides. No islanders regarded it as stealing, as for them the rules of salvage meant that once the bounty was in the sea, it was theirs to rescue. This of course was not the view of the local customs officer, Charles McColl, who was incensed at the blatant thievery that was going on. Not a penny had been paid in duty for this whisky so Mr McColl whipped up a furore and made an official complaint to the police. Villages were raided and crofts were turned upside down. Bottles were hidden, secreted, or sometimes drunk in order to hide the evidence. Bank at sea, the official salvage attempts were not going too well, and it was eventually decided to let the Politician remain where she was. Mr McColl, who had already estimated that the islanders had stolen 24,000 bottles of whisky, ensured that there would be no more temptation. He applied for, and was granted, permission to explode her hull and as one islander, Angus John Campbell, commented: "Dynamiting whisky. You wouldn't think there'd be men in the world so crazy as that!" In 1947 Donald MacPhee, a local South Uist man, found eight bottles of whisky in the wreck. He sold them at auction for £4,000. The tale of the wreck and looting of her cargo of whisky by the islanders was immortalised in the novel by Sir Compton MacKenzie and in 1949 one of Ealing Studios finest black and white film comedies "Whisky Galore" and a remake of this brilliant film in 2017. We have been researching this famous and unique ship for the past six months with the intension of salvaging some of her wreckage to make some unique gifts. In August 2011 we managed to arrange a trip to the Island of Eriskay on the southern tip of the western Isles of Scotland were she ran aground in February 1941. Unfortunately due to the adverse weather conditions we were unable to arrange a dive at the site. We did however on our second visit manage to get to the part of the coast that’s within a few hundred yards of the wreck site were she ran aground. 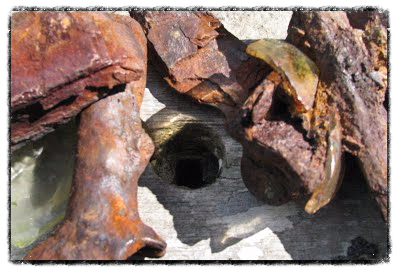 We were fortunate and surprised to find lots of signs of her wreckage including rusted steel small and large. We also found lots of weathered broken glass washed up from the whisky bottles. We even found a piece of steel that was so rusty that the glass had welded itself onto it. In the same location we also found just one piece of large but sound very weathered Teak. Teak is used extensively in this type of ships as it is extremely durable and requires very little maintenance. After all the research we have done and going to Eriskay seeing and collecting the material ourselves it is clear that this piece of Teak had to have come from only one place the S.S Politician. Since we have been back we have seen a dive report. It seems unlikely that any more timber will come from this wreck.